So in case you haven't heard, Twincess and I got married recently. Now Master Funkowitz will have to think twice before trying to write me up for being late. 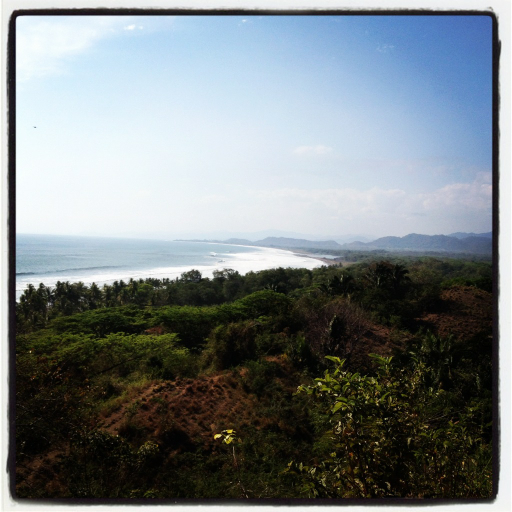 Back to business, so on our honeymoon we journeyed to the sunny beaches of Costa Rica for a week of relaxation. What does that have to do with the Maus? Well always interested in the culinary exploits of various cultures I was struck by how much the cuisine of Costa Rica had an identity all it's own, albeit full of Latin American mainstays, yet was highly influenced by the tourist based economy the country possesses. No matter where we were at whether it was the small hut on the beach, the family owned popular bar/restaurant or the fine dining of the resort restaurant, there was always some interpretation of what the tourists would want, in addition to the traditional Costa Rican cuisine. 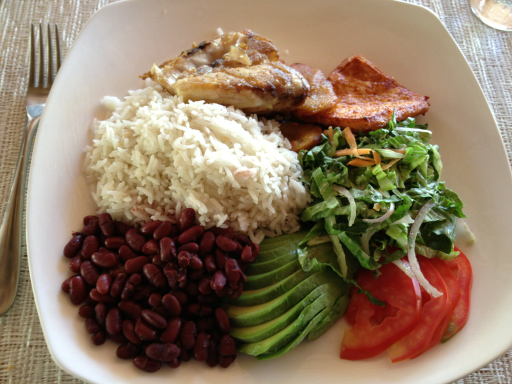 Costa Rican cuisine is defined by a simply spiced, yet not spicy array of side dishes accompanied by protein. Flavors are clean and straightforward across the board, there is a play with local products such as coffee rubs and mango glazes.. The main staple as in most Latin American countries is rice and beans. This forms the basis for the most standard of breakfast staples, gallo pinto. Gallo Pinto is white rice and black beans mixed together and served with eggs, plantains and a slice of cheese. The dish is ubiquitous and any and every place has their own mixture of spices to characterize it as their own. The plantains are typically fried, bringing out te sugars and having the sweetness counter the favors in the rice and beans. The cheese is interesting, since it is rarely served as a topping the way we use it here in the States, rathe it is served as simply a single thick slice, sometimes fried. It is a simple white cheese that has a salty flavor and little depth otherwise. The casado is the main lunch dish and depending who you talk to the name derives from either the dish being typical food for a married man, or the figurative marriage of ingredients on the plate. A casado starts with rice and beans, this time separated. Joined once again by plantains, this time we add a simple cabbage and carrot salad. Here we also see avocados frequently used, again rather than complicating it they are typically sliced raw and served fresh. The spices often saved for the rice and beans and whatever protein is being used. 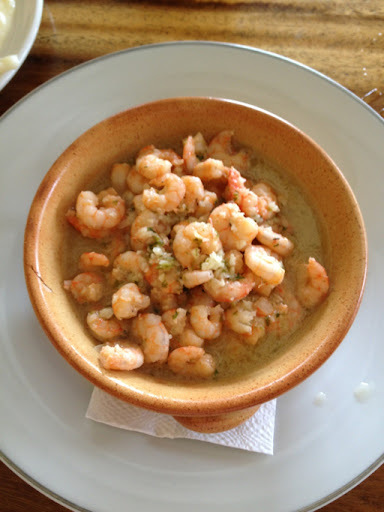 These two dishes we found everywhere and while obviously Costa Rican cuisine expands beyond these two simple dishes I was intrigued at how a basis was formed and then built upon by each restaurant to define it as their own. Before we get into the tourist influence I want to discuss the proteins we found. Now the protein becomes localized to accommodate availability. Seafood is fresh all around and is available everywhere near the beaches, it's still available in the city, but there is a distinct difference in the way the seafood was handled between the coast and San Jose. On the coast almost always the seafood is cooked in huge amounts of butter with garlic, salt and pepper. No matter what you ordered this is essentially how they treated the fish. Everything from shrimp to calamari to snapper and especially sea bass was bathed in butter and cooked to perfection. Garlic was used generously all around but the seafood was so fresh the flavors still came through. 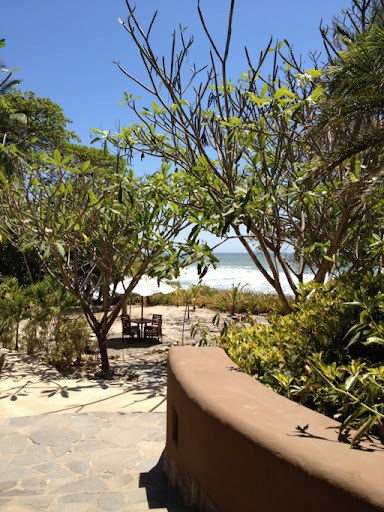 One of our finest meals came from a humble hut overlooking the beach. This provided Twincess with a terrine of shrimp and cilantro bathed in garlic and butter. Served as usual with some rice a small salad but this time everything came with mashed potatoes. We'll get to that soon. The cows across the country side are Brahma cows, significantly skinnier than anything you'd see here in the states. Along with sea food most places had at less one steak option. These were always served with amazing spice rubs. Many of them incorporating the coffee native to Costa Rica. The steaks were always lean and seared to perfection and served closer to medium than medium rare. The last dish I want to mention is the ceviche. Ceviche is another standard in many Latin American cuisines, and for those that are in familiar it consists of fresh fish soaked in citrus. The acid breaks down the fish and essentially cooks it without heat. This was another dish that was present everywhere. Typically served with red onions and cilantro it was amazing to see this dish evolve day to day, as whatever was caught that morning made its way into the dish. 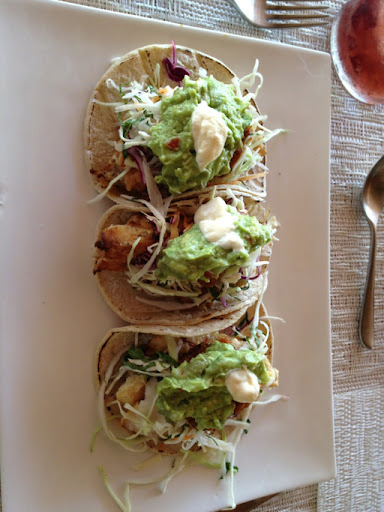 Each place we tried had a ceviche that was refreshing ad like every other meal, celebrated the fish more than anything. My favorite though, was at a restaurant in San Jose, that created the most unique take on ceviche I have ever seen. They started with a simple snapper and diced it into small chunks, they then served it with piece of diced green apple and avocado. They served it in a circle form soaking in lime and cilantro. When you took a bite the textural differences between the creamy avocado, the tenderness of the fish and the mild crunch of the apple played across your mouth in ways I never thought possible with ceviche the green apple and the lime played off the fish perfectly and left you a smooth an refreshing dish. Smooth is absolutely a word I never thought I would use when describing ceviche, but this restaurant pulled it off beautifully. That about does it for my short journey through local Costa Rican cuisine. I know that I've just begun to scratch the surface of what the country has to offer. I was blown away by their dedication to such fresh products as well as the alright induction of American mainstays. Even their tacos were piled high and full of toppings and sauces much more in line with the California style tacos, than the minimal small tacos with onions and salsa you find in Mexico. This was a journey I will remember forever, and I could never have asked for a better partner in my culinary exploits. I hope to ring you all more takes of foreign cuisine from first hand experience. Next stop? Who knows ..maybe Paris. 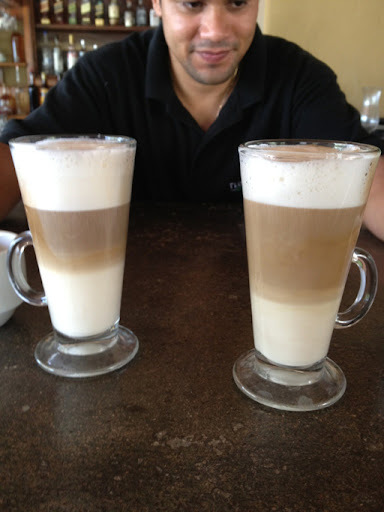 One last thought - I didn't even dive deep into how amazing the coffee was. 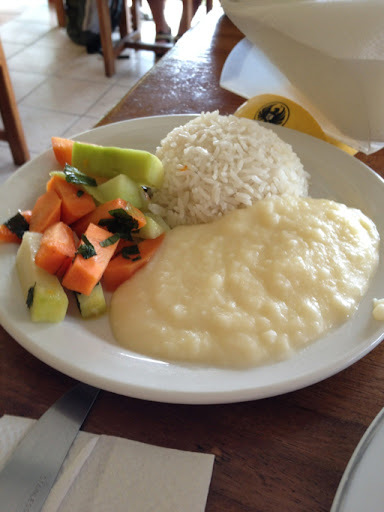 In costa rica all inclusive villas, The main staple as in most Latin American countries is rice and beans. This forms the basis for the most standard of breakfast staples, gallo pinto. 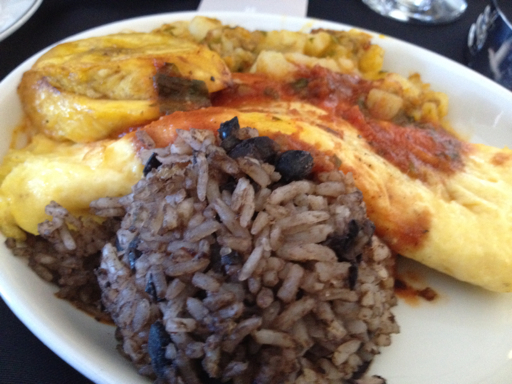 Gallo Pinto is white rice and black beans mixed together and served with eggs, plantains and a slice of cheese.